According to the recently released Promega 2011 Corporate Responsibility Report, Promega Corporation is on target to meet all six of its stated environmental impact goals for 2014. The report describes the significant achievements that Promega has made across its global operations in the areas of reducing environmental impact, contributing to community well being, and establishing sustainable business practices for the future. Promega reduced greenhouse gas emissions by 4.7% as indexed to revenue. Emissions from energy usage decreased by 35 tons of CO2. For the first time, more waste is being recycled than being sent to landfills. These changes are the result of concerted activities globally by Promega facilities. Electricity usage, the largest single contributor to the Promega carbon footprint, was reduced by improving heating, ventilation and air conditioning system efficiency at Promega headquarters. At the EuroHub in Germany, more efficient light and refrigeration was introduced in the warehouse. The Aviation Operations building in Madison, WI, and branch locations at Mannheim, Germany; Sao Paulo, Brazil; Milan, Italy; Alcobendas, Spain; and Stockholm, Sweden, are all using renewable energy sources to power operations. Reduction in waste sent to the landfill was driven primarily by improved awareness and convenience for recycling at all Promega locations. In 2011, over 4,400 cubic feet of plastic pipet tip boxes were recycled rather than sent to a landfill. Because Promega recognizes that corporate citizenship encompasses more than environmental initiatives, the corporate responsibility report also highlights community service and outreach activities. Globally, Promega employees volunteered over 1,500 hours of their time to support education, and many charitable activities were undertaken including fundraising to support local and international causes including food and medical needs in Somalia, the United Way and World Vision Australia. Promega also recognizes that sustainable business practices mean investing to promote innovation, improve customer service and enhance operational efficiencies. To these ends, Promega began construction in 2011 for a current Good Manufacturing Practice (cGMP) facility that will include many environmentally sensitive construction practices. Promega also implemented the first phase of SAP global enterprise solution at corporate headquarters and enhanced the Promega.com website to improve navigation and content management. The 2011 Corporate Responsibility Report explains the philosophy and goals that the company uses to align business practices with positive social, environmental and business outcomes. 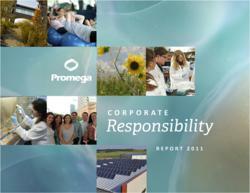 The 2011 Corporate Responsibility Report can be downloaded at http://www.promega.com/responsibility.